Published: Jan. 21, 2014 at 03:24 p.m. 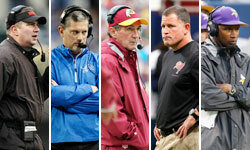 Updated: Jan. 22, 2014 at 03:01 p.m.
With Adam Gase becoming the latest candidate to shun Cleveland's advances, the Browns are zeroing in on the only two names still alive on their coaching wish list. NFL Media Insider Ian Rapoport reported Tuesday that Seattle Seahawks defensive coordinator Dan Quinn and Buffalo Bills defensive play caller Mike Pettine earned second interviews with the Browns this week, according to sources familiar with the team's thinking. Pettine talked with Cleveland's brass Tuesday night in Mobile, Ala. Quinn is expected to meet with the team in the New York/New Jersey area later this week. That meeting would need to happen at least a week before the kickoff of Super Bowl XLVIII. Asked if Pettine is simply going through the motions to gain interview experience, Tim Graham of The Buffalo News tweeted that a source close to the coach said that he wants the job "badly." Pettine spent years as Rex Ryan's trusted assistant with the Baltimore Ravens and New York Jets. Pettine's work with New York's defense is chronicled in Nicholas Dawidoff's "Collision Low Crossers," a gridiron epic painting him as the son of a coach and a football lifer. Pettine's Bills shattered a franchise record with 57 sacks in 2013. As for Quinn, this is his second stint with the Seahawks after leaving to run the University of Florida's defense from 2011 to '12. Taking over for Gus Bradley, Quinn's handiwork in Seattle has been a major headache for every team they've faced. The Browns also spoke with Atlanta Falcons offensive coordinator Dirk Koetter on Wednesday, Rapoport reported, per a source informed of the Browns' thinking. However, it was not a formal interview, and the team may circle back to him. FoxSports.com's Alex Marvez first reported that the team reached out to Koetter.